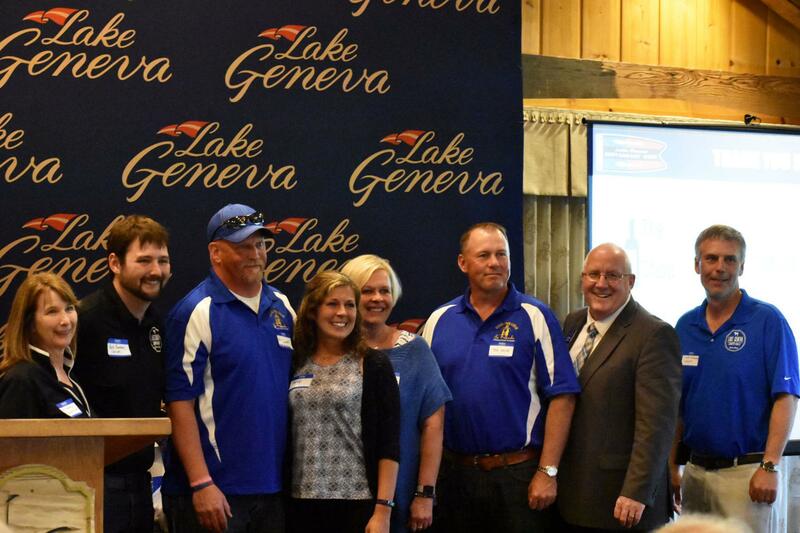 A nonprofit group that helps children battling cancer has been chosen to receive Lake Geneva Restaurant Week’s charity contribution of $5,000. Kisses From Keegan & Friends Pediatric Cancer Foundation was announced June 21 as the yearly recipient of charitable funds from Restaurant Week. The arrangement allows customers of Restaurant Week to dine for a cause. 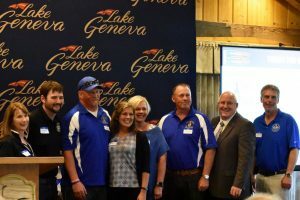 Diners vote after each meal for their favorite charity to receive a $5,000 donation sponsored by Lake Geneva Country Meats. The award was announced at Hawk’s View Golf Course where participating restaurants, sponsors, charity representatives and invited guests celebrated the fourth annual Restaurant Week wrap-up. Paul and Carey Denecke, along with other members of the Kisses From Keegan foundation board, accepted the check to support the group’s efforts to help those battling cancer. “Our mission is to provide wishes and joyful experiences,” Carey Denecke said. “Allowing families to put cancer on the back burner,” added Paul Denecke. The foundation started when the Deneckes’ daughter, Keegan, was battling leukemia. The battle was long, but after two years, Keegan won her fight with cancer. The family knew that once they returned to a position where they could help others, they would give back. The couple was honored to receive the Restaurant Week award.“I’m still shaking,” Paul said. “Every charity was deserving.”The couple voiced gratitude to all the diners who voted for Kisses From Keegan. Joe Tominaro, director of marketing and development at VISIT Lake Geneva, said each year organizers of Restaurant Week strive for more people to fill out “charity checks” designating their preferred charity. This year, more than 3,000 charity check ballots were collected with an estimated 8,000 diners visiting area restaurants during the week-long promotion. Twenty-seven restaurants participated in the event in early June. Every year, five charities are selected from public recommendations to appear on the ballot. The five charities for 2018 included: Walworth County Walk to End Alzheimer’s, Open Arms Free Clinic Inc., The Tree House Child and Family Center, Big Foot Emergency Food Pantry and Kisses From Keegan.